greeting cards. Email professional looking ecards directly from within StudioLine. 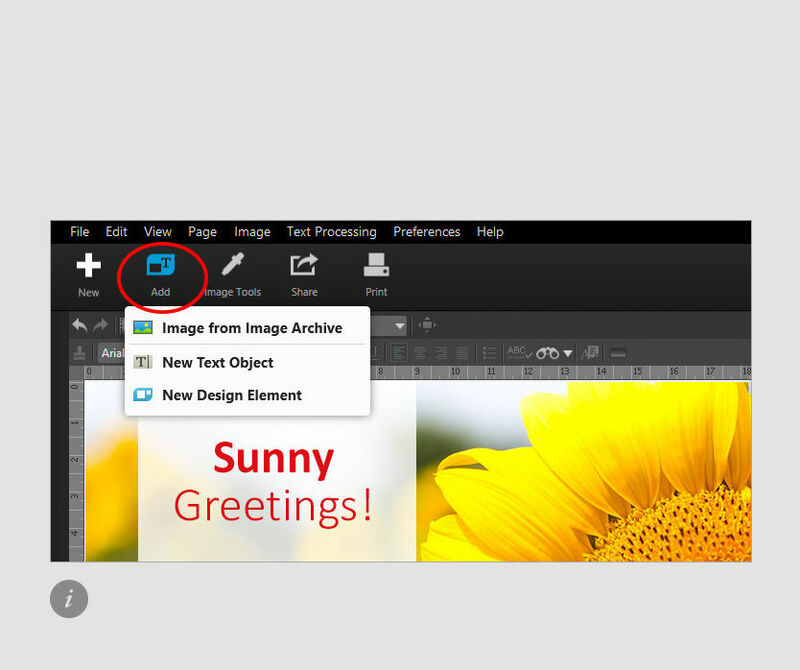 In the image archive, click the right mouse button on a suitable image and choose «Create Collage» from the context menu. The selected image will be centered on a new collage work space. Arrange your personal photos and texts, or use one of our time-saving templates. The default layout is around 842 x 595 pixels, equivalent to the DIN A4 paper format of 8.27 x 11.69 inches. Use «File - Page Settings» if you prefer a different format. If you have any email software installed on your computer, you can send your greeting card with a few clicks. 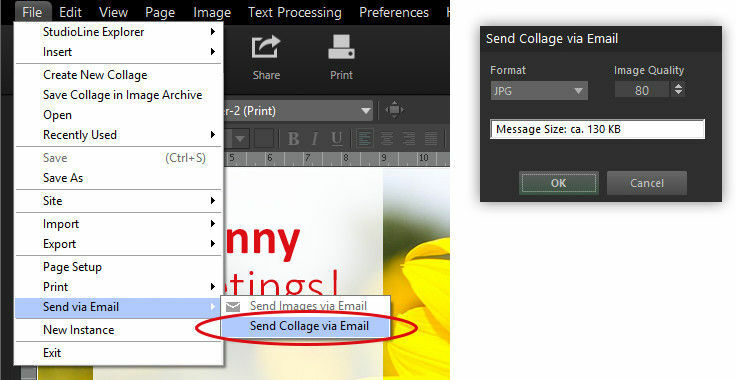 From the «File» menu, choose «Send via Email > Send Collage via Email». then choose the image quality. This opens a new message in your standard email software, with the collage as an attachment, ready to be sent. To use an online email service (web mail) instead, simply export your collage to the disk drive, then insert that file as an attachment to a new message you are composing. Have fun designing your own sunny summery ecards! “Design Elements” will simplify your layout («Add | New Design Element»). Items dropped into a design element can be aligned automatically. Design elements can also be turned into handy geometric objects (rectangles, circles), which can be enhanced with borders, colors, background patterns, shadows and transparency effects. Let your creativity run wild! Choose «Image from Image Archive». Navigate to the desired folder and drag your motif onto the page. Choose «New Text Object», click at the desired location in your design and type your text. Design your ecard by clicking «Add» on the toolbar.